I’ve sat here for several minutes unsure of how to start or what to write about Volnay. There are no fun anecdotes, tidbits, or trivia. So here it is: Volnay, they make wine there. Ok, here are a few tidbits, although I must warn you they are pretty unremarkable tidbits. Volnay is often some of the lightest red wine of the Côte, soft and very fragrant. There are no Grand Cru vineyards there, but several Premier Cru vineyards that are highly regarded. 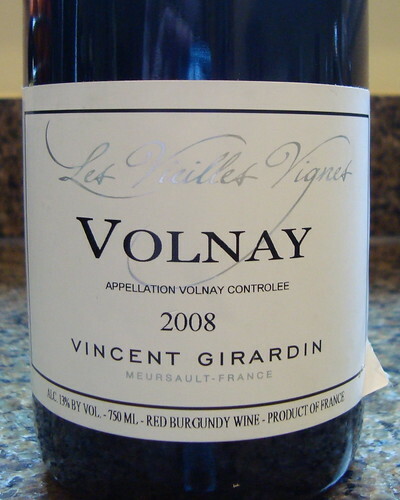 The 2008 Vincent Girardin Les Lieilles Vignes Volnay that I drank was in fact very light in color. I noted that is was more like a dark pink wine (fuchsia almost) that was translucent. On the nose were sweet cherries, and a fresh smell- almost like mint. I could also smell the alcohol, although I had just opened the bottle and at 13% ABV it’s by no means a monster. It had a light body, light, but firm, tannins and was quite earthy with an aftertaste of stones. Myles did not like it, I thought it was fine but not great. So, there you have it. A wine from Volnay. I’m really behind here (I drank this wine something like 10 days ago). It took me a while to locate my tasting notes! As I always do before writing a post, I got out my hulking copy of the World Atlas of Wine and read the entry for the Côte Châlonnaise. I couldn’t possibly think of a better way to describe the 2007 Antonin Rodet Chateau de Mercey Mercurey Rouge as compared to the wines from the Côte d’Or I’ve drunk since-- please stay tuned, posts will appear shortly. (By the way, Mercurey is one of five major communes here in the central strip of this area, the most "celebrated" of the region. ) It was a reddish pink, and light, color. It smelled very fruity and fresh, but also of dried cherries. It had a light body and soft tannins, but the acid was bitter and the wine was a bit green overall. Too vegetal and earthy, absolutely no fruit. Though drinkable, I’ve had many pinots from various places around the world that are better than this one. Though it is part of Burgundy, Chablis is 100 miles north of Beaune (the upper end of the Cote d’Or) and is closer to the Champagne region. It was once a vast winegrowing region, and the main supplier of wine for Paris via the region's vast system of rivers. Although, the advent of the train blew that out of the water (pun intended). It is a very cool region, and Chardonnay is the only grape here. The vines are very susceptible to frost during budbreak, although modern frost prevention technologies have helped to improve chances the crop isn’t lost. 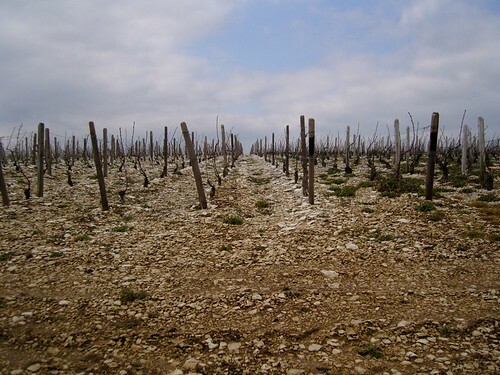 The region has a limstone clay soil that supposedly produces flavors in the wine that cannot be reproduced anywhere- a true expression of terroir. Most winemakers in the region favor unoaked wines fermented in stainless steel. Typically the wines have very high acid, on account of the very cool climate, and often have flavors of stones and minerals. When the wines are young they are often a little green in color, but many of the best wines have the potential to age for decades. Unfortunately, Chablis, the name, has been highjacked by many cheap wine producers outside the region and used to label any old white wine. The region is fighting back and trying to protect their name from this awful swill. 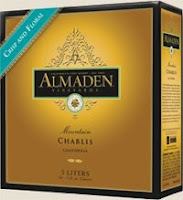 My advice: if the Chablis is coming to you in a 5 liter box, steer clear. 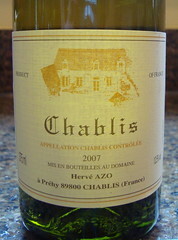 The 2007 Hervé AZO Chablis half bottle was both creamy and a bit oaky on the nose and the palate. It was very acidic and light with bitter green apple and wood. Not too bad, though certainly not the best. After writing and nearly posting this post I realized that I had, in fact, purchased two bottles of Chablis, the second being the 2009 Château de Maligny Chablis 1er Cru "Montee de Tonnerre" for $26.99 at K&L. I remembered that I had intended to drink them back to back to compare a more standard Chablis to a premier cru. So much for good intentions. This wine was creamy with hints of flowers and wood on the nose. It had a creamy acidity, but fairly light mouthfeel. It tasted of lemon rind, sweet grapefruit and wet stones. Definitely worth paying for the premier cru!